ARR is running two workshops at the Practical Responses to Climate Change Conference as part of the Engineers Australia Convention 2014. We’ve had to reschedule the full day event “What’s happening in flooding in Australia” to 27th November 2013. Full details are still available in our original post and registration is via EA’s website. UPDATE: this has been rescheduled to 27th November 2013 at the same venue. The Water Panel is pleased to announce, despite the late notice, that the next event on its calendar will be a full day event titled What’s happening in flooding in Australia. This will be held at the UTS Aerial Function Centre on 23rd October and will cost $70, students are free but must pre-register. The cost will include full catering for the day. Update 2013-10-02: the event registration and payment gateway is now up an running. Work towards making flood study mapping information freely available from a central location through an online flood information portal. Analyse Geoscience Australia’s historic archive of satellite imagery to derive water observations to help understand where flooding may have occurred in the past. Improve the quality of future flood information by completing the revision of the Australian Rainfall and Runoff (ARR). Printable Flyer: a PDF printable flyer is available for download. assess the performance of the method of fragments model using the same statistics and locations that were used in Frost et al . Arising from this project, methods were developed to allow for the generation of sequences of point-rainfall at the resolution of the pluviograph data (in this study taken to be in increments of 6-minutes) at any location in Australia. The testing conducted in this phase of work focused on statistics relevant for using continuous simulation in flood frequency estimation. Specifically, the method was tested in the context of the capacity to reproduce both extreme rainfall and the antecedent rainfall leading up to the annual maxima event, with the suite of methods generally performing well against these metrics. Flow around buildings and People Safety presentation will be held at the 19th Queensland Water Symposium on 27-28 Sep in Brisbane. HWRS 2012 will bring together a large audience of academics, government officials and industry practitioners. Symposium highlights will include presentations from various researchers working on the 21 Australian Rainfall and Runoff Revision Projects, and keynote speeches from some of the world’s leading experts in hydrology and water resources. Dr Rob Vertessy, of the Bureau of Meterology has been confirmed to give the Munro Oration. 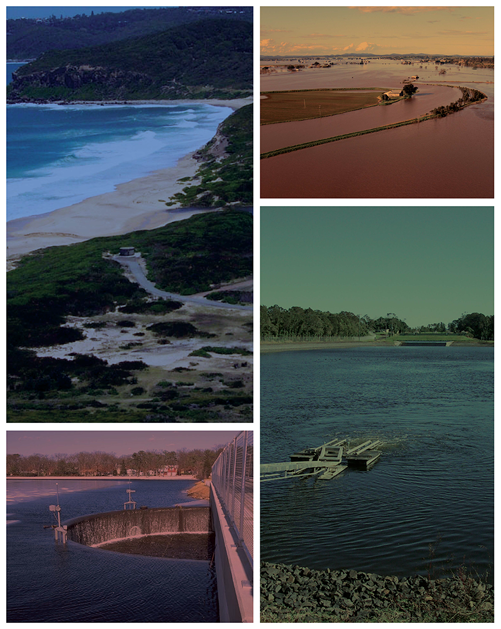 This report presents the outcomes of a pilot study into the application of statistical joint probability methods on extreme rainfall and storm surge in the coastal zone, with a view to providing guidance on the degree of interaction between these two physical process, as well as describing how this information should be applied for the estimation of flood risk along the Australian coastline. As part of this study, three separate areas of work were conducted: (1) the compilation of a large dataset of historical storm tide records at a number of locations along the Australian coastline, which when combined with the existing records of daily and sub-daily rainfall, can form the basis of an empirical study on the joint dependence between these variables; (2) a review of the statistical extreme value modelling literature with the objective of developing a model that can identify the strength of dependence between these variables; and (3) the identification of a methodology by which information on dependence between extreme rainfall and storm surge can be translated to a flood variable (such as a flood level or flow rate) at any location along the Australian coastline. Engineers Australia with the Assistance of BoM and CSIRO have developed their climate change research plan which outlines research necessary to define the impact of climate change on design rainfall, losses, temporal patterns for incorporation into the next edition of ARR and beyond.